Diamond was from the same pony pocket dimension that Daisycutter came from. Ever since she was a filly, she was always fascinated by machines, taking them apart and rebuilding them into inventions of her own. During the Armorvor invasion, she was part of Daisycutter's resistance, having been the one to figure out how the Black Core armor works and modify it for ponies. She also used the same technology to replace her left leg when she lost hers in an Armorvor attack. When the war was over and the enemy chased back through the rift they came from, she followed Daisy through the portal, as she too felt like she no longer belonged with her equestrian bretheren in her realm. She now follows Daisy in her mercenary adventures, maintaining her gear and sometimes providing backup on missions. 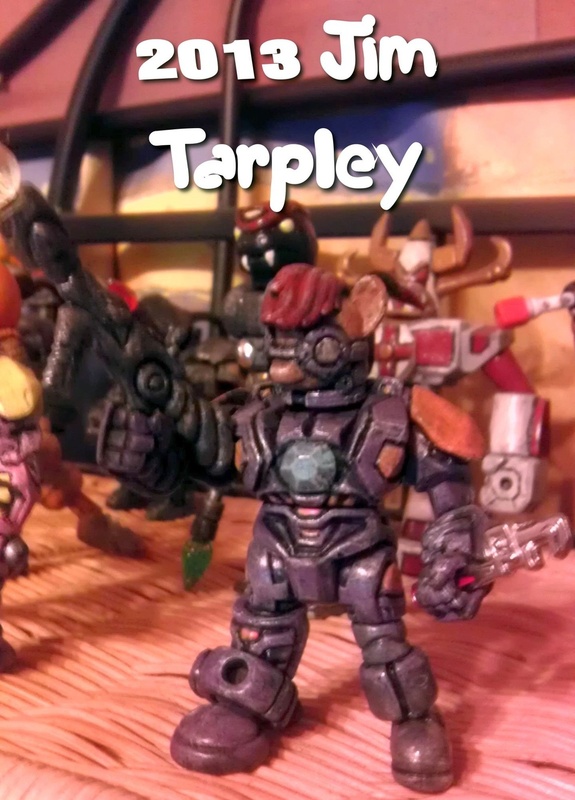 Made from a Glyos Armorvor, an MLP blind bag pony, and various other toy bits. Hand painted and clear coated.